Listen to "Kitchen Confidential: Adventures in the Culinary Underbelly" on your iOS and Android device. Don't "read" this book expecting detailed recipes or a "how to" on owning your own restaurant. 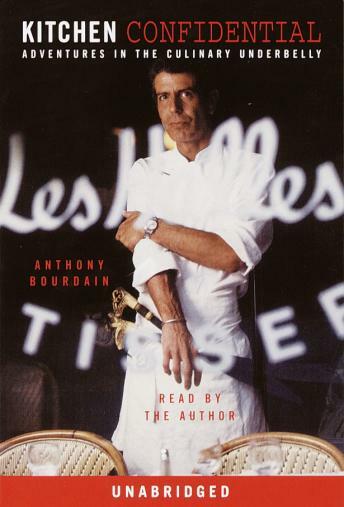 Bourdain's book was a great one to listen to, the narrator was very playful, and the content of Bourdain's life in the restaurant industry very entertaining. I highly suggest this (mostly) non-fiction as an "off the beaten path" book, full of great stories, a few insightful know-hows, and just enough vulgarity to make you really feel this Chef's "no-bull" mantra. This was a very realistic look at how many kitchens are behind the scenes, for all its glory and hardships. This was my first Anthony Bourdain book and I will have to read the others. He narrates the book perfectly, he gives you little tastes of what it feels like to be in a big time kitchen and really shows his love of food. I love this book, and Anthony Bourdain. His narration was great, and over all a great entertaining book that helped pass the time during a road trip. I highly recommend to any fellow foodie out there. Totally entertaining. Anthony Bourdain does a great job of narrarating and he had me laughing frequently. Enjoyable even for a reader who isn't interested in the culinary world. I personally thought this was a great book to listen to. I think the author did a wonderful job telling of his experience in the restaurant industry, and I think he made a great reader of the book. I'm glad it wasn't someone else. Sure the content can be coarse, but read the jacket, how can you not expect that going into it? I found myself driving with barely surprised laughter more than a few times, and I haven't listened to much that got that much out of me yet. I will now likely try his other audio book that is available. I appreciated his honesty, but he eliminated my agency as a person who is a vegetarian - and he sadly excluded me from eager inclusion in his magical story. Really enjoyed this frank and realistic look a the inside of the kitchen of some very good (and some not so good) New York restaurants. His writing is vivid and colorful, so that you feel like you're right there with him. However, note that if you object to bad language, you won't be happy with this book! The first couple CD's were interesting, but I lost interest and couldn't finish. If you love fancy foods, you might be more interested than me. I am not a chef. As a matter of fact, I don't even use my stove at home. Nonetheless, I am loving this title by Anthony Bourdain. Each time I get in the car and listen to him talk about his many (mis)adventures in cooking, I find myself either laughing out loud or cringing at the thought at the next inevitable meal I will have at a local restaurant. If you're not easily offended by foul language and low moral standards, this book is a raucous ride. I'm not sure how Bourdain survived to tell the tale, but he's a great story teller and an engaging narrator. I'd read the book awhile ago, but it was much more engaging to hear his voice, putting an entirely different spin on his colorful language. (His insults alone are worth the listen.) Aside from a short chapter on "professional kitchen tips," the purpose of the book is entertainment, and not insider advice on cooking or running a restaurant. Idle daydreams about someday opening a restaurant won't be so appealing after you listen to this one! Bourdain vividly paints a picture of the intensity of a professional kitchen, the odd characters drawn to the profession, and the sense of family that emerges when people work together under these conditions. You might even gain an appreciation of WHY that meal at your favorite "fine dining" establishment costs so much!